Being human is wondrous, amazing, weird…. We think of ourselves as very cerebral, especially in comparison to other mammals. We think about thinking and how the mind works. Yet, we would not be ourselves without our bodies, or animalistic senses. As neuroscience writer Jonah Lehrer says, “The self emerges via the act of attention. We bind together our sensory parts by experiencing them from a particular point of view.” Being human involves more than thinking, computing, and our digital interfaces… it involves taking in the world around us with our highly developed vision, hearing, sense of touch, etc. These aspects of experience inform my artwork, whether it be the surreal images I use in a painting, or a functional object designed to feel good in the hands (or some combination of the two). Lisa moved to the Roaring Fork valley in 2010 to participate in the artist-in- residence program at the Carbondale Clay Center, and set up her studio first at the old S.A.W. location on Euclid Street. The new space on Buggy Circle provides the perfect environment for her to produce functional ceramics and encaustic paintings. 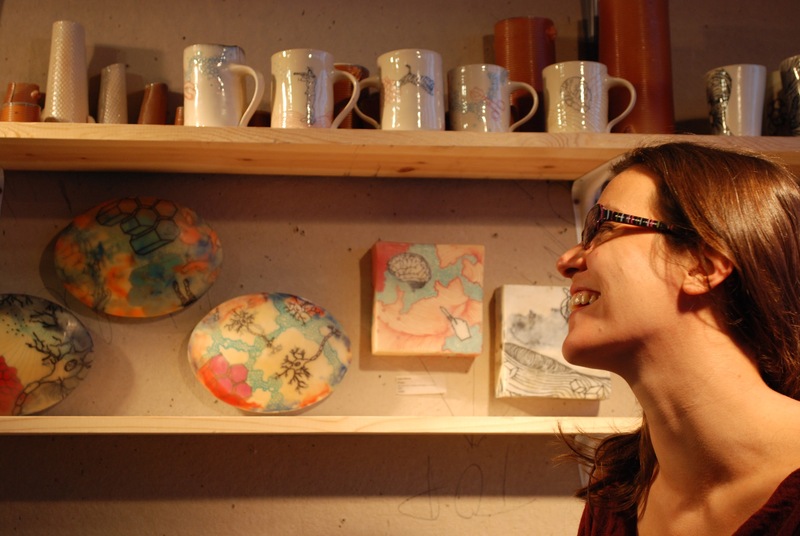 Lisa has been teaching ceramics at CMC Aspen since 2015, and also teaches periodically at the Carbondale Clay Center. She earned her MFA at San Diego State University, and BFA in River Falls, Wisconsin. Lisa’s recent solo exhibitions have been at the ArtShare Gallery in Glenwood Springs, and at Franklin College in Indiana. Her work can be found regularly at the Carbondale Arts shop known as the Artique in the Launchpad, the Carbondale Clay Center sales gallery, or at S.A.W.